This blog post is part of an ongoing series in collaboration with Archives Month Philly, a city-wide festival each October celebrating historical records, archives, and rare books. Learn more and check out their events calendar at https://archivesmonthphilly.com. Guest blogger: Nadia Hassani of the Spoonfuls of Germany blog, for the Horner Library of The German Society of Pennsylvania. As much as I love the foods of my native Germany, if someone had proposed a monument to bratwurst or sauerkraut, I would have shaken my head in dismay. But… a monument honoring the pretzel in Philadelphia – absolutely! See all Monument Lab proposals with the word "pretzel"
How fitting and appropriate for a German pretzel monument to be here. Philadelphia is the pretzel capital of America. Pretzel consumption in Philly is higher than in any other city in the United States. Philadelphians consume 18 to 24 pounds pretzels per person and year, that’s 12 times more than the American average. I also like the idea of a German pretzel monument because its symbolism is varied and open to interpretation, as flexible as raw pretzel dough and as open as the pretzel’s center. Over the centuries pretzels in Germany have gone through a wide range of spiritual and religious symbolism. 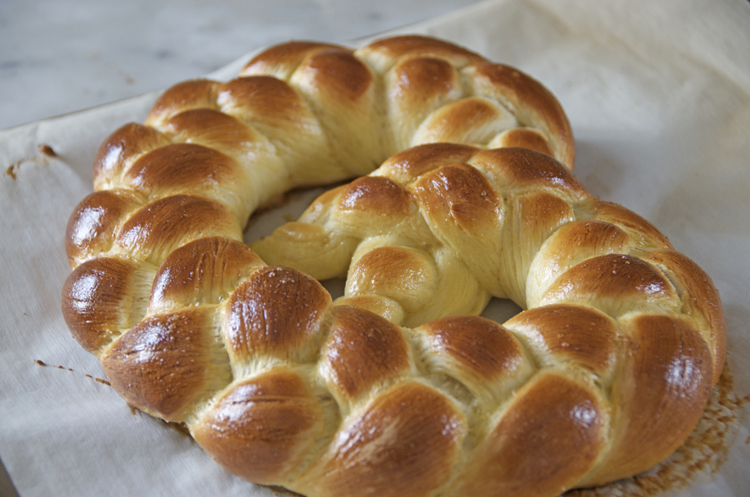 At one time or another, pretzels in Germany were baked for almost every holiday, as good luck pretzels for the New Year, for Easter and Christmas, during Lent and for weddings to symbolize the wedding knot. You can read into a pretzel what you like and that, I think, is a pretty amazing thing for a symbol that goes back almost 1,000 years when the pretzel first appeared on the coat of arms of the German baker’s guild where it has remained ever since. Pretzels were introduced to America by the Pennsylvania Dutch in the 1700s and Pennsylvania maintained its leading role in pretzel making ever since. Today, about 80% of the pretzels eaten in America are made in Pennsylvania. Pretzels stand for an era of Philadelphia history whose traces are nowadays impossible to locate because there are almost no German bakeries left in the city. Last year I spent an afternoon at The Horner Library of The German Society of Pennsylvania. I had visited with the intention of looking at historic cookbooks. Instead, I stumbled upon the legal statutes of the Social Support Association of the Philadelphia Bakers, founded in 1855, and the Golden Jubilee 50th Anniversary Edition of the Confectioners’ and Cake Bakers’ Beneficial Association of Philadelphia from 1922. These guilds and associations played an important role not just because they supplied baked goods to the city dwellers but also because they provided social services to members. I saw ledgers listing, in neat German fashion, all the dollar amounts paid out in sick and death benefits, as well as contributions to “patriotic events”. Going through several old German and German-American cookbooks I have found a wide variety of pretzels. There is more to pretzels than the soft or crisp pretzels sprinkled with salt that most people know nowadays. One of the books at the Horner Library, The United States Cook Book: A Complete Manual for Ladies, Housekeepers, and Cooks, published in 1877 by Schäfer und Koradi just down the street from where the German Society is located on Spring Garden Street, contains a recipe for small lightly sweetened buttery pretzels. 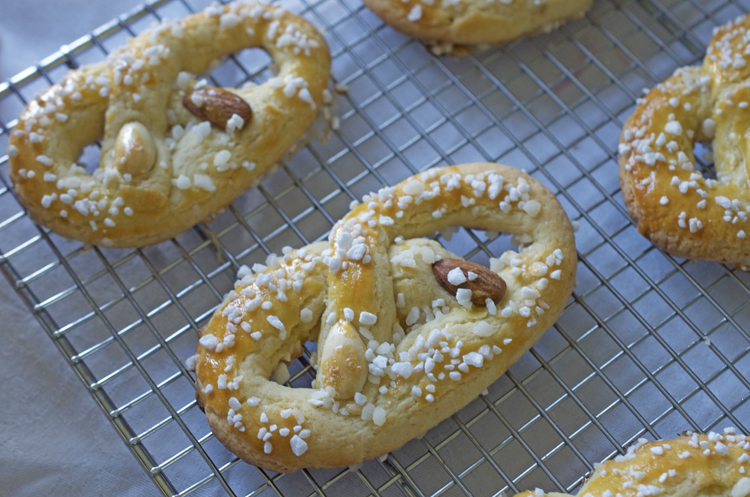 I can attest these pretzels are scrumptious because I have baked very similar ones from other historic cookbooks. A pretzel monument in Philadelphia will stick around a lot longer than the pretzels that we quickly eat on the go. A pretzel monument is also a strong reminder that many foods we enjoy every day were brought to America by immigrants, and that without immigrant foods – be it pretzels or culinary traditions from any other immigrant group – our diet would be pretty dull. Want more Philadelphia food history? Visit the German Society of Pennsylvania on October 18th, 2017 at 5:00 pm for their event, “Christopher Ludwick: Gingerbread Man and Baker General of the Continental Army.” See full details on the Archives Month Philly website. Or, visit the Horner Library during their open hours to explore their collections for yourself! Nadia Hassani’s blog is spoonfulsofgermany.com.